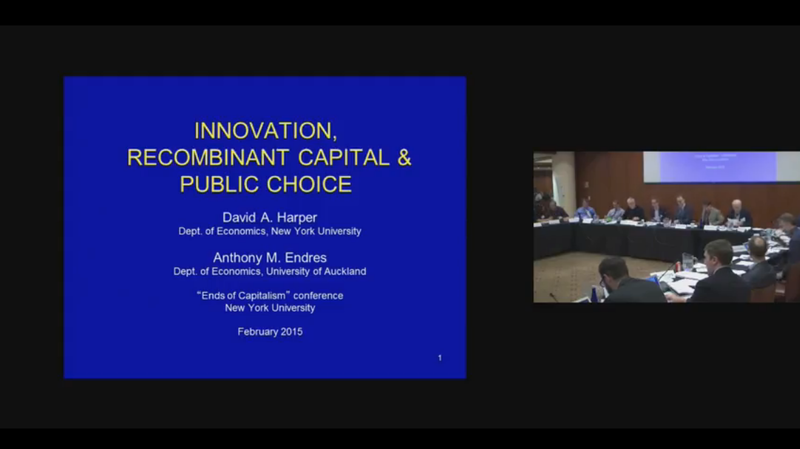 Harper, David Endres, Anthony M.
The first objective of this project is to investigate the nature of innovation from the perspective of the theory of recombinant capital. This approach brings capital formation into the spotlight of the microeconomics of innovation. The project focuses upon how innovative entrepreneurs interpret market developments, specify and evaluate new capital combinations, and make markets for new goods. The second objective is to apply the recombinant-capital framework to critique the “systems of innovation” (SI) approach to innovation policy, which presumes various market failures and “system failures”. The third objective is to examine the implications of the recombinant capital approach for the political economy of innovation policy, for the design of innovation policy and for heuristics for guiding policy development. Recombinant capital and innovation is an independent research leaded by David A. Harper and Anthony M. Endres at NYU.